Passion cooking – The taste experience begins with the eye! David’s second greatest passion after singing and performing is cooking! With much love, time, meticulous product selection and a great sence of flavor combination, he creates mouth watering delicacies that also impress visually. You can find many of the finished dishes regularly on David’s second Instagram profile @davidemoorecooks and under the hashtag #davidcooks. He sometimes presents individual steps of the preparation in Instagram stories, too. In 2019, David will take his passion cooking a step further. He’ll combine his vocation of singing with his passion of cooking: and there you’ll have his new cooking show Music, Meals & Moore. Lifestyle consultant Frédéric of Frédéric loves advises clients on topics such as fashion, beauty and trends. Of course, a healthy lifestyle also requires a light, healthy, variety full diet. David was invited in 2017 to Frédéric’s TV production, and gave tips from his own experience of how to make a dietary change. 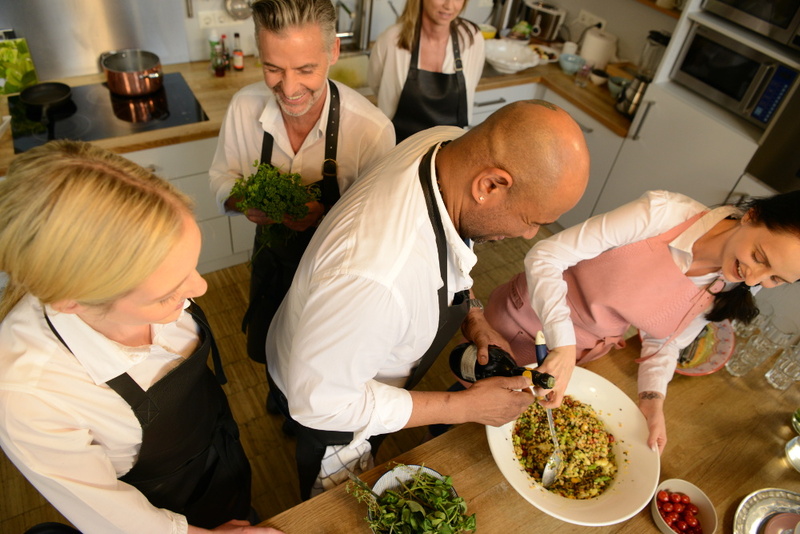 David together with the guest prepared a smorgasbord of delicious dishes for guests and crew to enjoy in the studio kitchen of tvision.